Hikers, bicyclists and horseback riders of all ages and abilities can enjoy the Trailway. Because it is a reclaimed railroad bed, it has flat grades and gentle curves. From northwest of Weatherford in central Parker County, the Trailway travels 20 miles west to the downtown district of Mineral Wells in eastern Palo Pinto County. It connects to Lake Mineral Wells State Park, where you can camp and picnic. The Trailway is 20 miles long and 10 feet wide. Two miles of surface from the downtown Mineral Wells trailhead toward the east are asphalt. Finely crushed and screened limestone tops the remaining 18 miles. The 16 bridges have decks and rails for safety. The Trailway's 500-foot signature bridge allows safe travel over U.S. Highway 180. The bridge, adorned with 104 Lone Stars, meets Americans with Disabilities Act requirements. Note: The Trailway may close during wet weather. All four trailheads have paved parking, drinking water, restrooms, trail information and accessible parking. Pay fees at the self-pay stations located at each trailhead, or at the Lake Mineral Wells State Park headquarters. Weatherford Trailhead: Off FM 920, northwest of downtown Weatherford. Garner Trailhead: Next to FM 113, two miles north of U.S. Highway 180. State Park Trailhead: In Lake Mineral Wells State Park. A portion of the trail that connects the park to the Trailway has a steep grade. Mineral Wells Trailhead: Next to U.S. Highway 281, four blocks south of U.S. Highway 180. The Trailway crosses gently rolling hills and numerous small creeks in the Brazos and Trinity rivers' watersheds. It winds gently through remote farm and ranch lands. The rolling hills are abundant with wildlife. Trail users might see white-tailed deer, turkey, raccoon, fox squirrel, and many species of birds. Plants are typical of the western cross timbers region. In spring and fall, the many trees and flowers that line the Trailway offer a vivid, colorful panorama. The Weatherford, Mineral Wells & Northwestern Railroad carried more than 33,000 passengers in 1899. Most came to Mineral Wells for the town’s "healing water," mineral baths, and resort climate. The financial panic of 1903 put an end to elaborate expansion plans. Jay Gould, well-known railroad magnate and financial manipulator, bought most of the railroad’s stock. 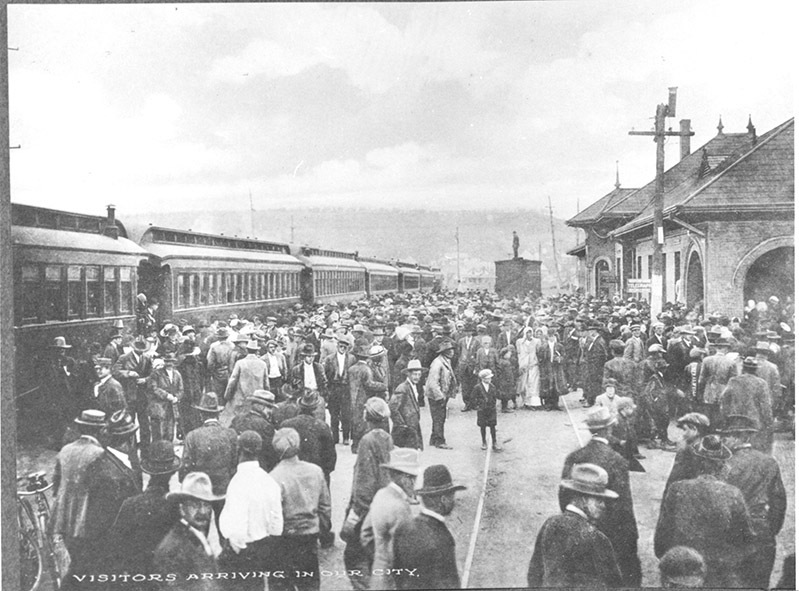 Shortly after, the Texas & Pacific Railway Company took control. The T&P Railway merged with the Missouri Pacific Railroad in 1976, and became the Union Pacific Railroad in 1983. 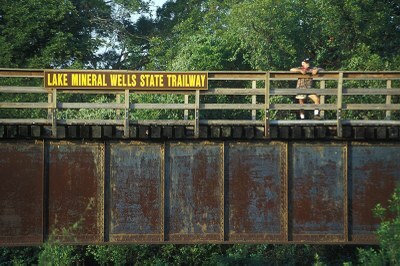 Mineral Wells purchased the line in 1989, and renamed it the Mineral Wells and Eastern. It served as a freight line until the spring of 1992, when the city decided it was not economical. The Interstate Commerce Commission authorized abandoning the line in October 1992. Lake Mineral Wells State Trailway opened on National Trails Day, June 6, 1998, as part of the 75th anniversary celebration of state parks.